SCVHistory.com | John Boston | How did Alex Mentry Die? How did Alex Mentry die? Webmaster's note: This was the best information available at the time this piece was written. It has been superseded by newer information. Click here. if only one had a couloured pencil long enough to draw on the ceiling." Today marks the 101st anniversary of the death of Alex Mentry. Dude. We hardly knew ye. A century-plus later, we are trying to unravel the mystery of his passing. He was still a pretty young fellow  just 54 when he died in a most odd fashion. 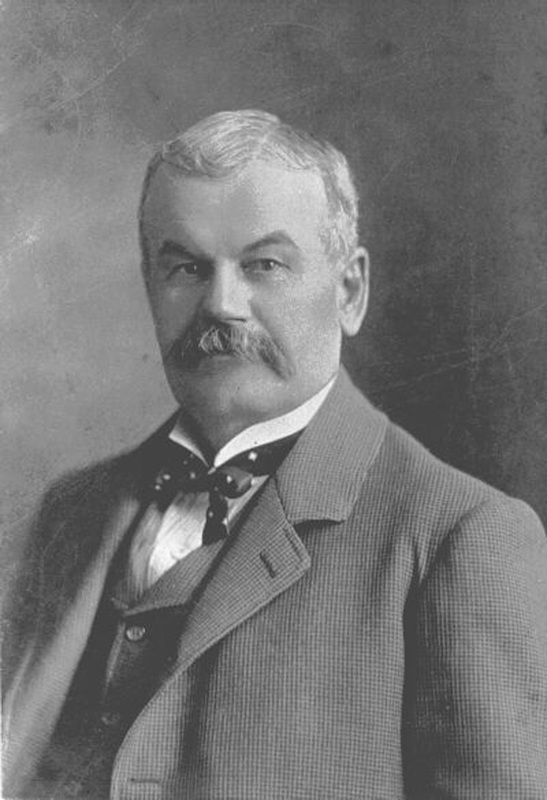 A pioneer oilman in the Santa Clarita Valley, he was born Charles Alexander Menetrier. His father shortened the family name to Mentry and Chuck changed his first name to Alec or Alex. Mentry had been involved in the first commercial oil fields back east in Pennsylvania. He came out to beautiful downtown Newhall where he would eventually build a house in Placerita Canyon and take a leisurely buggy ride to work in Mentryville. He had expanded on the first successful commercial oil well in California  the historic Pico No. 4. A week and a century ago, on Sept. 26, 1876, Pico No. 4 started pumping out oil and it continued to pump oil for over 100 years. Eventually, a few hundred people would settle in a small village that would be known as Mentryville. Story is the little town was the first community in California to enjoy natural gas lighting. There are lots of interesting tidbits about this oil town. It had its own school district  Felton. Mentry would eventually move from Placerita to build a 13-room mansion. (It's in the finishing touches of renovation by the Friends of Mentryville. Gooooo, Friends.) Mentry was not a fan of drink or foul language, so booze was outlawed and if workers were caught swearing, they had to drop a few coins into a glass jar. We're just starting the 21st century, and a grand coalition of locals and outsiders have helped build Mentryville into a peaceful historical oasis where one can picnic, hike, mountain bike, horseback ride or take tours of the park. And that's all well and fine. But how did Alex Mentry die? Former valley historian Jerry Reynolds thought Mr. Mentry was allergic to bees. If so, he picked a really lousy place to work. Pico Canyon is right next to Towsley Canyon, which, at that time, was home to one of the biggest bee hives on the planet. Reynolds told a story that Mentry was fatally stung by a bee. Our own good historian, Leon Worden, is on the fast track of becoming a town character and pretty much does the Death Scene from "Camille" when approached by anyone with a question on anything. Leon begs that the Death-By-Bee Theory goes the way of UFOs have a landing base in Canyon Country and Nixon shot Kennedy. Then, there was this story floating around in one august local historical source that Señor Mentry was done in by something called, a "love bug." When I say, "Love Bug," I don't mean the international computer virus from a couple of years back or Herbie, the lovable talking Disney Volkswagen. We're talking plecia neaurotica. But a little research showed that Mr. and Mrs. Neaurotica are more famous for their in-public and Kama Sutra procreational passions and committing suicide by splattering themselves on our windshields than being deadly. Fact is, love bugs don't even bite. Carol was most dang helpful in clearing up the mystery of the passing of poor old Alex. Carol was friends with the daughter-in-law of Alex and she shared a conversation they had several years back. Carol had been friends for years and called her, "Aunt Gladys." AG recalled that, over the years, Alex kept getting bit by a bug while he slept. His wife never got bit. Alex did. Every time he got bit, he got sicker and sicker. Finally, in 1900, he got bit by this mysterious bug yet again. On the lips. Mentry's condition worsened. He was taken to a hospital in Los Angeles. He contracted pneumonia and died. So who was the perp in this mystery? Certainly it wasn't the non-biting love bug. It was something from the tratoma genus. On the street, the murderer has two names  one disarmingly sweet, the other rather alarming. The beast is called both the "Kissing Bug" and the "Assassin Bug." It also goes by the moniker of "Bloodsucking Cone Nose." Sounds like something yelled out from the podium at city council meetings. It's not quite an inch long, has this big sucking mechanism coming out of its puss, and, worse, it attacks people at night when they sleep. Cue the cheap Canyon Theatre Guild Dracula organ music, please. They sometimes are found in bathtub or sink drains (or Mentry's bed sheets) and can inflict a painful bite. Or, in Alex's case, a deadly one. According to the prestigious Ohio State Entomology Department, usually, these bugs are found outdoors (where, when you think about it, most bugs are found). They frequent hollowed-out trees, possum and raccoon dens and are usually near wood rat nests. "Indoors," the report went on, Kissing Bugs, "... are found in bedding, floor and wall cracks, under furniture, etc." Well that's hunky dory. The Buckeye Bug Dept. just described my rural Santa Clarita home and everything around it. On the bright side, I've never been bitten. But a friend of Carol's has. Years later, Carol's pal was nibbled on by one of these local Assassin Bugs. She nearly died. She was taken to our local Henry Mayo, treated with some miracle anti-bug juice, recovered somewhat nicely and now is a renowned community leader. As for poor Alex Mentry  yick again. What a way to go. Bitten on the lips while you're sleeping and yours head swells up like a watermelon. What a way to go. Some might hold that if this Kissing Bug, this poor-flying blood-sucking little vampire, had not bitten Mentry, today he'd be 155 years old. Me, bug bites or not, I don't think the guy would have made it. ©2001 JOHN BOSTON & SCV HISTORICAL SOCIETY · RIGHTS RESERVED.